There have been a few posts here (here, here, and here) in the last week or so around the issue of population size and GDP per capita – not because my prior is that there is any such relationship but (a) because I think there isn’t, and it is worth occasionally illustrating that across countries, and (b) because even some officials in the New Zealand government still appear to believe that our (small) size is a material element in the story of what holds New Zealand back. There are arguments why, in theory, a larger population might result in better long-term economic performance (higher productivity), but whatever the merits of those arguments they seem to have been outweighed by other factors. In the world we currently live in, the average big country is no more economically successful than the average small country, and that is so whether one throws all 190 countries into the mix at once, or looks only at advanced countries, only at European countries, only at moderately-sized countries (eg excluding China and India) or whatever. And one might imagine a plausible story in which economic success might have led to more population (migration or natural increase) rather than the other way round. But what does the picture look like for US states? Across all 50 states (one dot per state) here is the cross-sectional picture. And again, no obvious or statistically significant relationship. In fact, to make the dots a bit easier to see, I left off the (non-state) District of Columbia which with about 600000 people has per capita GDP of about $160000. 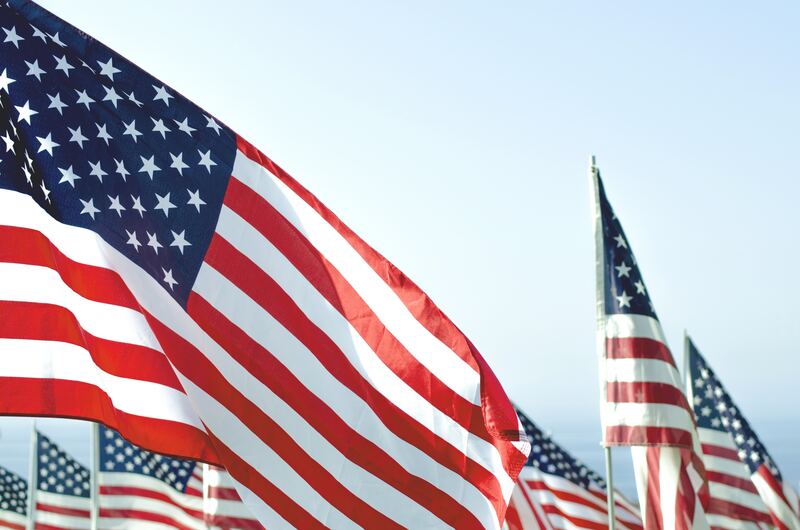 The US case is interesting because – unlike the situation with comparisons across individual countries – there is no legal obstacle in the way of US citizens (and residents) moving within the country (across state lines) to pursue opportunities. In that sense one might have (actually I initially did) expected to see more populous states also being more economically successful, if only because of internal migration. 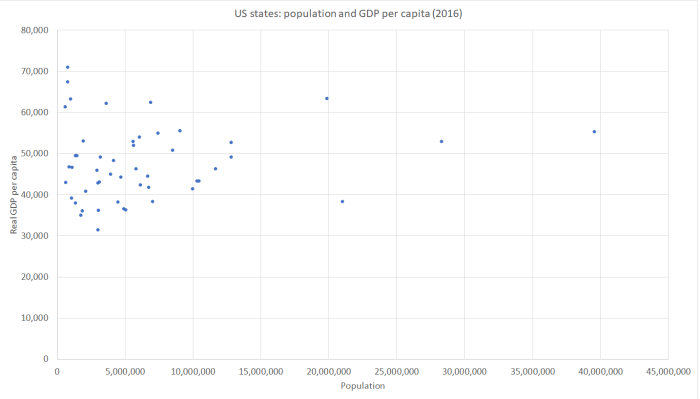 But the relationship between population size and GDP per capita seems about as weak across US states as it does across countries. 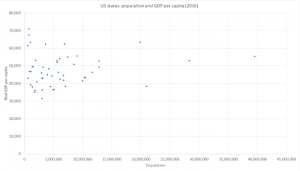 I wouldn’t want to make anything much of these US state comparisons – I just did them because the data were there, and having dug it out I thought I’d share it. After all, in various places, big metropolitan areas straddle two or more states (New York is the best known example). Then again, there is more policy similarity across US states than there is even across member states of the EU – so a few more things are help constant when one looks at the simple scatter plot this time. Whatever the theoretical arguments, a bit of history suggests we shouldn’t be surprised at the lack of any sustained relationship between population and economic performance. After all, at its 14th century peak – as probably the richest place in Europe – Florence is estimated to have had a population of fewer than 100000 people.